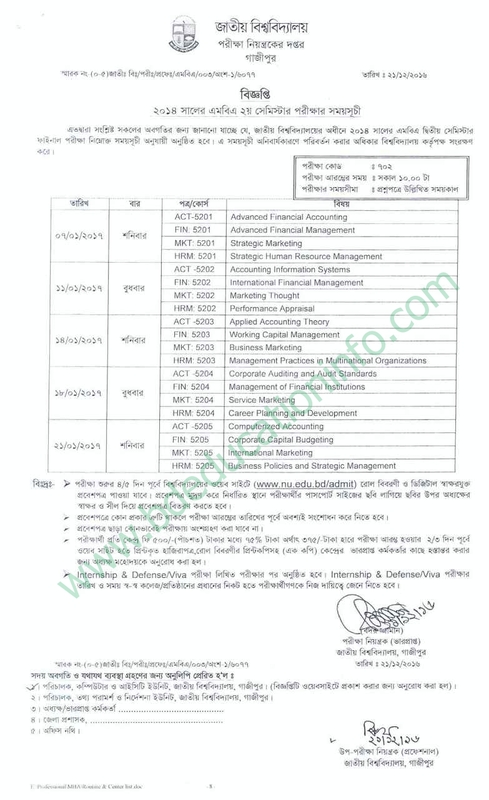 MBA 2nd Semester Exam Routine Published on National University Official website www.nu.edu.bd . Download Your Master of Business Administration (MBA) Examination Routine from www.bdeducationinfo.com . MBA Exam will be held on 07 January 2017. This exam will be start on 10 Am . Bangladesh National University has published notice to NU MBA 2014 2nd Semester Exam Routine Center on 21st December 2016. Now Check this Routine below. MBA exam code 702 and this Exam will be end on 21 January 2017. For more updates about MBA Secound semester Exam Routine or Result Keep visit this website. Thanks for Stay with us. This entry was posted in Notice, Nu Notice by admin. Bookmark the permalink.